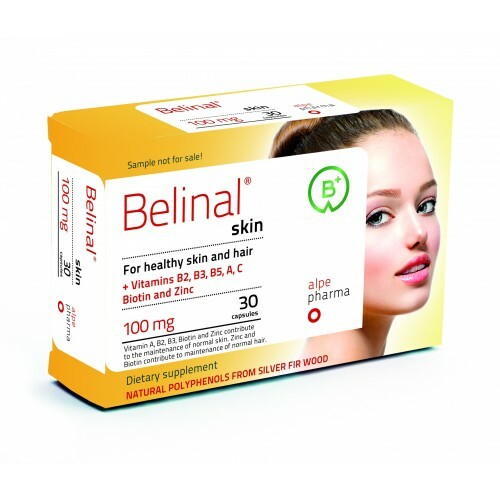 Belinal® skin - a revolutionary formula has been developed on the basis of propriety clinical study, it contains Belinal® - polyphenols from silver fir branches and natural vitamins B2, B3, B5, A, C, Biotin and Zinc. • support hair growth and hair care. Your skin is the largest and the most beautiful organ of the body and is the mirror of your well-being, health and energy. Therefore, take care and nourish your skin from the inside through the bloodstream. Skin needs daily balanced micro-nutrients for regeneration and protection against UV rays, cold and pollution. Most cosmetic creams work only on the top layer of skin while Belinal® skin works through the bloodstream and nourishes lower layers of the skin. Enjoy your skin! • Contains Belinal® - patented natural extract from silver fir branches. • Unique formulation of natural polyphenols from silver fir branches and vitamins B2, B3, B5, A, C, Biotin and Zinc. • Developed on the basis of propriety clinical study in Europe. 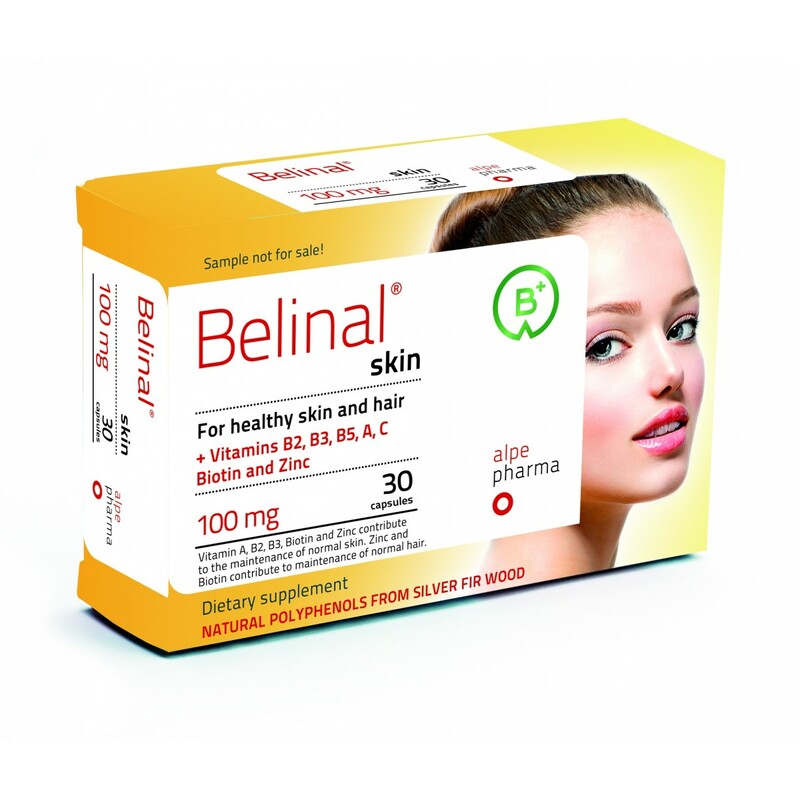 Belinal® skin is unique dietary supplement developed on basis of clinical trials. The power of the natural herbal extract Belinal® with vitamins and minerals ensure daily freshness of your skin. Belinal® is a water extract from silver fir branches from the largest European pristine mountain forest. Top scientists, led by University of Ljubljana and Clinical hospitals carried out research and clinical studies that confirm bioactive components of Belinal® are extremly effective and bioavailable. Small molecul mass ensures diverse polyphenols to break through cell membrane and act where they are needed. Belinal® is protected by three patetnts, and has clinically proven benifits that contribute to health and well being. Products Belinal® combines our branded and uniqe ingredient Belinal® and carefully selected natural vitamins and minerals. Belinal® products are developed based on propriety scientific research and clinical studies, published in scientific journals. Each product is carefully designed and adheres to the highest standards and the everyday needs of modern man. Belinal® skin contains an extract from the fruit of acerola - wild cherry, which has 20 times more vitamin C than lemons. Vitamin C plays an important role in collagen formation for the normal functioning of the skin. Retinoic acid is added to formulation due to its the most active form of vitamin A and which regulates the growth and development of the skin and mucous membranes, and their activities. Riboflavin - vitamin B2 and niacin - vitamin B3 contribute to maintaining healthy skin and mucous membranes. Pantothenic acid is also known as vitamin B5, and is responsible for the growth and regeneration of tissues. The product also contains Biotin and Zinc. Biotin also known under the name vitamin H and helps maintaining healthy hair and skin. Zinc is essential mineral and works as a cofactor in various enzyme reactions and helps maintaining healthy hair and nails. It also participates in the synthesis of collagen. Skin shows probably the most visible consequences of the aging of the organism. Skin aging begins after 25 years, after 30 years first delicate wrinkles apeare, after 40 years the skin confronts to demaged lines. At age of 50 the skin becomes looser and with deep wrinkles. According to the latest findings the major cause of the skin aging is natural aging of the organism, however, UV rays of the sun, stress, smoking and poor diet are proven to accelerate the aging process. The skin is composed of visible upper layer of skin - the epidermis and the middle layer - the dermis and hipodermis. Dermis consists of collagen and elastin fibers that give to skin strength and elasticity. Collagen and elastin fibers must be intact and each other precisely regulated. Only then the skin will outward act of youthful, radiant and supple. However, the modern pace of life, sun, stress and smoking leave visible traces on the skin. All the aforementioned bad habits greatly increase the amount of free radicals, which are literally tearing collagen and elastin fibers, which causes premature skin aging. Your skin is the largest and the most beautiful organ of the body. It's the mirror of your well-being, health and energy. Cosmetic creams usually feed only the top layer of the skin - the epidermis, and they don’t penetrate in the lower layers. It is vital to provide through the bloodstream balanced micro-nutrients from Belinal® skin for the regeneration and protection of all skin layers. .
Belinal® skin is beauty supplement with essential nutrients that deliver nourishment at the very deepest level, and provide specific support to help maintain great looking skin, hair and nails all year round. Belinal® skin is dietary supplement and contains a patented extract from silver fir branches Belinal®, vitamins B2, B3, B5, A, C, biotin and zinc. Belinal® silver fir branch extract (Abies alba Mill. ), an extract of acerola fruit (Malpighia glabra), bulking agent: micro-crystalline cellulose; zinc citrate, nicotinamide, calcium D-pantothenate, riboflavin, retinoic acid, an anti-caking agent: magnesium stearate, and silicon dioxide; D-biotin. sweeteners, lactose, yeast extract, gluten, artificial colors, preservatives, and are suitable for vegetarians. For children under 3 years of age, pregnant women and nursing mothers you must consult with your doctor or pharmacist before taking Belinal® skin. In the case of prescripted medication send us by e-mail info@alpepharma.si and let us know what medicines you take and when. Our doctor or pharmacist will be writing you a messages or restrictions if exist. Dietary supplements are not a substitute for a balanced, varied diet and a healthy lifestyle. Recommended daily allowance must not be exceeded. I thank you for Belinal®, because Belinal® skin is definitely the right choice for my skin. I will continue using the capsules. Thank you! Drago and I regularly take two capsules.